Loss of genome stability is one of the hallmarks of the enabling characteristics of cancer development. Homologous recombination is a DNA repair process that often breaks down as a prelude to developing cancer. Conversely, homologous recombination can be the Achilles' heel in common anti-cancer therapies, which are effective by inducing irreparable DNA damage. Here, we review recent structural and functional studies of RAD51, the protein that catalyzes the defining step of homologous recombination: homology recognition and DNA strand exchange. Specific mutations can be linked to structural changes and known essential functions. 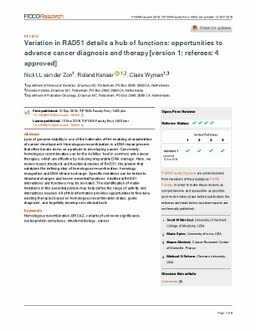 Additional RAD51 interactions and functions may be revealed. The identification of viable mutations in this essential protein may help define the range of activity and interactions needed. All of this information provides opportunities to fine-tune existing therapies based on homologous recombination status, guide diagnosis, and hopefully develop new clinical tools.